I’m not a runner, I’m a super-fast walker. I learned it from my Grandma, who used to walk so fast I had to walk-skip-gallop-walk to keep up with her. When I walk around my neighborhood (at a slightly slower pace so I won’t look ridiculous), I ponder things, and I pray. I have a really hard time praying for any length of time, with any heartfelt honesty, when I’m sitting still. 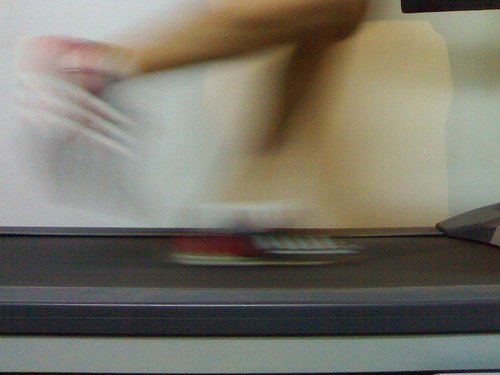 When I get on the treadmill at the gym and step up the pace, it’s as if a dam has been broken. This is how I picture it: All the pondering and praying and dreaming I’ve been doing has trickled in, pooling together behind that dam. When the dam is broken, all of those random contributions that have been sitting together, blending, come out as crystallized, whole ideas. It’s a wonderful feeling, of course. In those moments, I feel like I can solve any problem, overcome any obstacle, and accomplish any feat. All of the potential and possibility in me is no longer hidden. It’s right there, within reach. During those moments I am the best I can be—my body is in motion, my spirit is open and attentive, my mind is sharp. And even though that high can’t last, I think it teaches me something about God and the person he created me to be. He created me to be whole, in body, mind and spirit. He teaches me that I’m at my best when I’m embracing all of the parts of me that he created and loves. He doesn’t want me to compartmentalize my life or my self—I am not a writer and thinker at some moments, a sexual being at other moments, and a nurturing mother when my children need me. I am all of those things, all of the time. Even when the world urges me to neatly delineate who I am, even when my thoughts compartmentalize themselves, trickling into my being as separate tributaries—even when I schedule “writing time,” “prayer time,” “exercise time,” and “family time”—God wants all of that goodness to merge, and then to emerge, whole. My body, mind and spirit were created to be great collaborators. I only need to allow them to mingle freely and often. I also feel wholly at my premium best when in motion … particularly outdoors, near nature (thankfully, just about everywhere in Vancouver – even downtown – is surrounded by nature). All the ideas flow, effortlessly … so much so, that at times it’s a deluge. I’d never given it much thought … just learned to embrace it … but I like your reasoning. I feel quite fortunate to be living in Vancouver ~ the whole entire city is like one really huge gym, LOL. God shows up at the pool every day. He listens to me talk about me. For his voice in everything. In graceful strokes like breathing. Or who I’m talking to. Sitting and praying is one of the hardest things for me. I’ve been thinking about that a lot lately. I know exactly what you mean about getting on the treadmill and your mind finding freedom. I have a similar experience on my walks. I compare it to my rabbits who are pent up all night and are set free in the morning. They leap straight into the air, tear in circles around the room, and make sideways leaps as they hop around. My mind feels like that when I walk. It’s interesting to think that our minds need a work out much like our bodies. Roxanne, that’s exactly one of the things I love best about my town—it isn’t exactly Vancouver when it comes to beauty, but it is very walkable and bikeable. I find I am nurtured in different, but important, ways with each type of physical activity. I also like the conversations that happen when I’m walking with my husband or one of my daughters, and can recall many good conversations while walking with my mom. Tara, I find the “balance is out” idea so fascinating. My impulse is to say “No! We need balance!” but when I really think about the distinction that you’re pointing out, I see how it fits perfectly with these ideas that have been emerging from my gut. A single, fundamental self. Alignment. I like it. Thanks! Ed, I’m curious—do you think your mind and soul are meant to function together, but the world tends to pull them apart? Or do you think they are so fundamentally different that we have to really work at finding places of common ground for them to mingle? I guess what I’m wondering is if your soul also finds freedom when your mind finds it, or if they insist on taking turns. That’s hard to say. I used to get really opinionated about discussing mind, body, soul, spirit, and their various combinations, but I hit a point where trying to get a handle on it left me even more confused. I think it’s easy to get muddled with spirit and soul especially. Are they different or the same? I don’t know. In addition, what’s the difference between mind and soul? Is the mind part of the body? Is the soul part of the Spirit? I really don’t know the answer to that! Oh, I agree. I find God on my “comfort beach’–a little stretch of local beach where the harbor opens to the ocean, the hills are on my right, the islands straight ahead, the wide expanse of beach to my left. The ocean reminds me of grace and love as I soak in the beauty of the sky and all around me. I come to the beach to praise, to question, to just be. And I walk the entire length, taking it all in, watching it change, comforted by the fact that all is as is should be. I also know if I haven’t been to that beach in a while, it is because I know *the answer* but it is one I don’t particularly like, or am afraid of so I gather my faith and go to the beach anyway. God is always there, ready to meed me exactly where I am.